5 Questions in 5 Days: What do Browns have in Mike Pettine? As the Cleveland Browns work their way through training camp, sorting out roster questions – like who the quarterback will be and so on – one of the biggest questions has flown a bit under the radar. 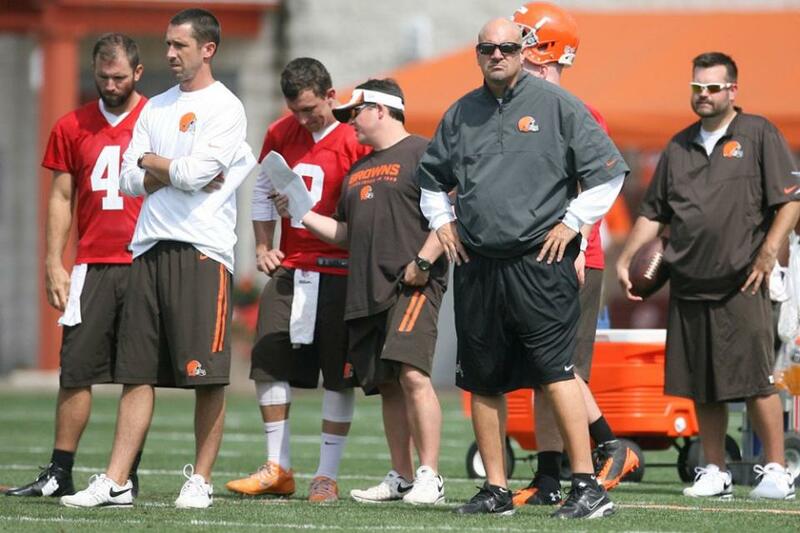 Namely, just what does the team have in head coach Mike Pettine? The Browns certainly took a less-than-direct approach when it came to hiring Pettine – the ninth head coach hired under three different ownership groups since the Browns parted ways with Marty Schottenheimer after the 1988 season. But just because former front officer members Joe Banner and Mike Lombardi bumbled their way through the hiring process doesn’t mean that Pettine is not the right man for the job. There is little doubt that style will play well, not only with Browns fans but also within in the AFC North, where the Browns have had their lunch money stolen repeatedly over the years by Pittsburgh, Baltimore and Cincinnati. Prior to his time with Buffalo, Pettine spent a number of years working with Rex Ryan, first as a defensive coach in Baltimore and then as defensive coordinator with the Jets. We’ve been reading the book Collision Low Crossers this summer and it goes into detail about the relationship between Ryan and Pettine, while also sharing some of their defensive philosophies. One of the topics covered in the book is how the relationship changed while they were working with the Jets as Ryan struggled to transition to the role of head coach. That’s a subject that should be of interest to Browns fans. As defensive coordinator in Baltimore, Ryan was active in creating the defensive game plan each week. But once he took over as head coach with the Jets, that responsibility fell on Pettine. Once he was no longer involved in the day-to-day planning of the defensive, Ryan struggled to make the transition to being the big-picture guy. He wanted to give input in the defensive meetings, but didn’t want to infringe on the autonomy he gave Pettine as coordinator. In addition, as a defensive-minded coach, Ryan wasn’t always comfortable inserting himself into the offensive meetings. There are also several examples of Pettine (and other coaches) chafing at the special treatment Ryan gave to some of the players and/or coaches. Most notably, many of the defensive coaches believed that the team should have been harder on quarterback Mark Sanchez from the very beginning. Those are the same type of scenarios that Pettine will now face; hopefully he learned enough while with the Jets to avoid some of the same pitfalls that seem to have ensnared Ryan. 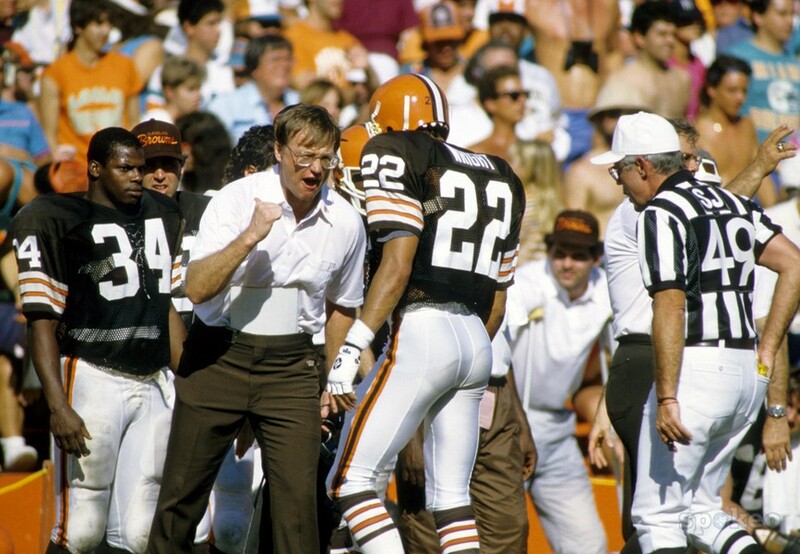 Pettine is a long-time defensive coach getting his first chance to be the head man in Cleveland – just like Marty Schottenheimer and Bud Carson, once upon a time. Carson, on the other hand, took over an aging team that was nearing the end of its effectiveness. After a coaching debut that seems hard to imagine all these years later (a 51-0 beat down of the Steelers, the last time the Browns opened a season in Pittsburgh, interestingly enough), Carson flamed out in his second year. Is Mike Pettine more Marty Schottenheimer or Bud Carson? We’re joined once again by Ryan Alton from Draft Browns, Mike Burgermeister from jimkanicki.com, Dave Kolonich, Murray Alexander from East of Ehlo, Jeff Rich from More Than A Fan – Cleveland, Rick Grayshock from Waiting for Next Year, and Mike Krupka from Dawgs by Nature. Mike B.: Better than both. I get what you’re saying about Carson’s ineptitude and that it was only rivaled by Pat Shurmur and Romeo Crennell. But I don’t think Marty was a terrific coach. His 5-13 playoff record is truly unprecedented, check how he ranks against other Super Bowl-era coaches in the playoffs. (For comparison’s sake, here’s that same list sorted with the top coaches.) A truer yardstick has not yet been devised. Talent gets you a nice .600-plus regular season win percentage; the playoff record is the mark of the coach. So no … Pettine will be 1,000 times better than Marty. I definitely think the Browns go to the playoffs this year, probably by winning the division. Dave: Let’s hope he’s neither one. Bud Carson was a top defensive coordinator over 40 years ago. Marty Schottenheimer’s been retired for nearly a decade. Neither of the former Browns’ coaches would stand a chance in today’s NFL. I could only imagine Chip Kelly’s Eagles or Peyton Manning hanging 70 points on Bud or Marty. Ideally, fans and media will allow Pettine to become his own coach and not attach lazy 1980s’ labels to him. As far as head coaching acumen, there’s no way to answer this question until Pettine actually coaches a season or two of games. Murray: More Marty I hope! I have a lot of faith in Pettine. They might have taken a very roundabout way to getting to him, but I think they got the right man in the end. He’s obviously a very good defensive coach as seen by his CV, and he seems like he’s a good leader. He doesn’t mind ruffling some feathers either, which is always fun. I think he’s going to light a fire under this roster. Jeff: Well, in the aspect that he’s not the understudy of the guy who isn’t cutting it any longer, he’d be more Bud than Marty. He’s bringing his own program to town, which Carson had to do, but Bud Carson wasn’t taking over a 4-12 team. I think Mike Pettine is more Marty Schottenheimer, re-defining Cleveland Browns football and putting his own stamp on it. This has been an organization that lacked an identity for a long time; of course, the message and that stamp mean little if they don’t win football games. Rick: The funny thing about this question is that I immediately thought of Marty’s failures in the post-season. Of course in Cleveland, we’d be ecstatic about getting to the post-season. I’ve been reading a lot about Pettine, and the thing that gives me some hope is that he isn’t just an x’s and o’s coach, he also is a good at delegation and developing coaches. Hopefully that turns out to be the case. Mike K.: This is honestly such a tough question. Thanks a lot for stumping me. 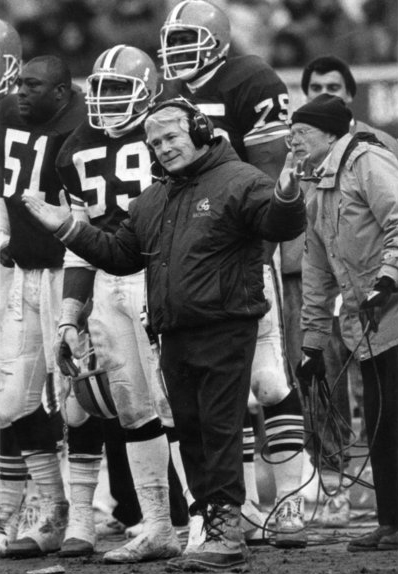 Although I want to say Mike is like Bud Carson because Bud was an innovative defensive mind – who won two Super Bowls with the Steelers – Bud was also fired as Browns’ head coach at the beginning of his second season on account of starting the year 2-7. If there’s one thing that I don’t want to see in Cleveland anytime soon, it’s our head coach getting fired. I want to see some consistency in Cleveland. That being said, I think as a head coach Mike Pettine is more like Marty because I see a guy who’s going to be a fiery, demanding and motivating coach that expects the best out of his guys. For purposes of this debate, even if we don’t make it to the Super Bowl, a la Marty, Mike Pettine is the guy I hope can at least turn this roster around and get us to the playoffs. Nice work everyone; if the Browns would bring it as consistently we’d be lining up for the Super Bowl parade already. If you missed Day 1 of the series, you can find it here. Day 2 is over here.